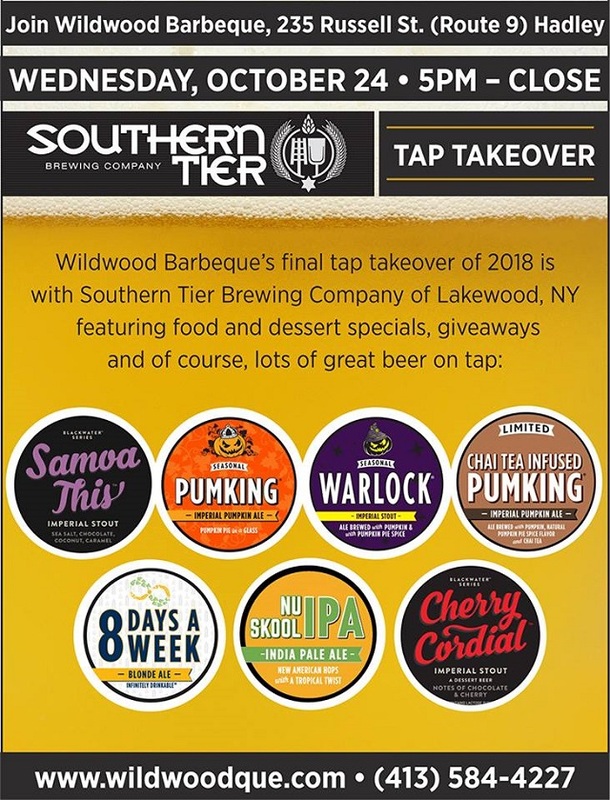 [Oct. 25, 2018]–Four pumpkin beers, two imperial stouts, two IPAs—not a bad lineup for the Southern Tier Tap Takeover at Wildwood Barbeque in Hadley, Massachusetts, last night. It’s not the first time the Lakewood, New York brewery has commandeered the spigots at Wildwood and October seems to be their month. Indeed, Halloween must seem something like a Holy Day, since the brewery is, well, responsible, for Pumking Imperial Ale, the semi-notorious pumpkin ale I’ve reviewed before. Same with its darker-souled sibling, Warlock Imperial Stout last year, where some brewery updates can be found. Both were on tap last night, as were two other iterations, the Chai Tea Infused Pumking, which was brewed in limited draft-only quantities, and the Cold Press Coffee Pumking. Only the Rum Barrel Aged Pumking was MIA. All are 8.6% ABV, not shrinking violets, though the impression with all is more spicy sweet than alcoholically warming. The brewery clearly believes in riding a winner hard. The 2XIPA substituted for the 8 Days a Week Blonde Ale and Crème Brûlée made a guest appearance it lieu of Samoa This, another in the portfolio of Imperial Stouts the brewery calls its Blackwater Series. Another is the Cherry Cordial, which did show up. The Crème Brûlée was also the only Southern Tier brew making an appearance in any beer store near me in recent days, so I grabbed it. 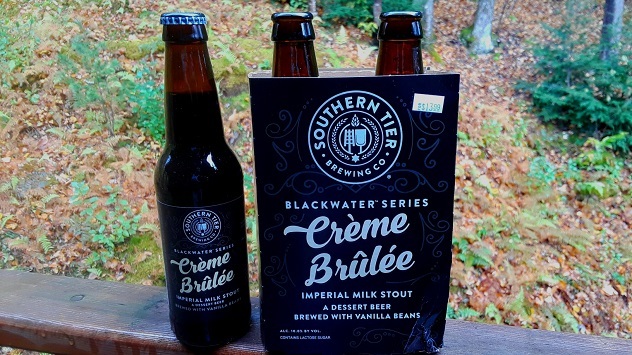 Like most of the other Blackwater beers the Crème Brûlée is pegged as a dessert beer, and the use of lactose sugar really throws them all into the Milk Stout category, albeit potent ones—10% ABV in this case. As with Pumking, it’s unlikely that one will remain ambivalent about the beer. You’ll love it, or it will seem too sweet to tolerate beyond the first few eye-opening gulps. Well, there you have it. The only thing that seems to separate this beer from actual Crème Brûlée is a caramelized crust on top. Well, and custard. There is a healthy tan head on a beer as dark as night. The body, if not as thick as custard, is full and creamy enough. I’m still awaiting word from the brewery to see if they’ll spill the beans as to what kind of four different malts and two hops are in the mix. There’s no question as to the presence of the vanilla beans used, along with an impression of brown sugar or molasses. In short, a beer that hits its mark with a bulls-eye. Only question is whether it’s one you want in your sights. Availability: Seasonal, more than 38 states nationwide.